The Rooftop Cinema at Curtin House screens everything from cult favourites to new releases and documentaries. A cinema on a roof in the heart of Melbourne. Owned and operated by a sharp team of creative minds, Rooftop Cinema is committed to showcasing arthouse, classic and recent release films in a completely unique urban environment. Rooftop Bar is open daily from 11am and we're licensed until 1.00am, so grab a drink before your screening and hang around with us after the credits roll. 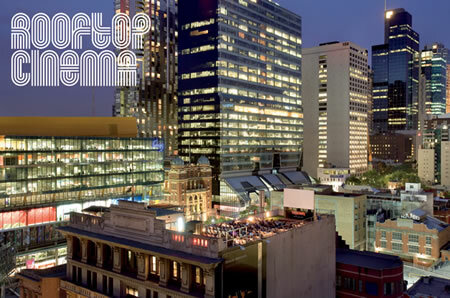 Enjoy the night lights, classic cinema and the rooftop bar! The Rooftop Cinema Box Office is open 5.00-9.30pm Tue-Thu and 5.00-9.30pm Sat-Sun. Seating starts from 9.00pm and we kick off the films at 9.30pm. Seating starts from 8.30pm and we kick off the films at 9pm. Seating starts from 8pm and we kick off the films at 8.30pm.